Every Valentine’s Day couples are inundated with information about cookie cutter romantic getaways complete with the standard candlelight meals, sensual massages and sunsets on the beach. But happy pairs everywhere know that romance is personal and doesn’t come prepackaged. That’s why many are discovering alternative escapes in Belize that fuse passion with a unique blend of fun and adventure. Couples can snorkel with one of the sea’s most majestic creatures, the whale shark. Measuring up to 50 feet long, the whale shark is the world’s largest fish species and can be found in the tropical waters of Belize’s Gladden Spit Marine Reserve between March and June. 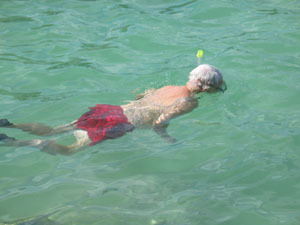 A dip in the Caribbean Sea with these gentle creatures is often described as a uniquely “humbling” experience and is sure to strengthen the bond of any couple. This adventure reveals the brilliant kaleidoscope of color found in Belize’s underwater flora, instantly taking any romantic getaway up a notch with memories that will never wilt or fade. Sign-up for private marine tours through: Sea Horse Dive Shop, Destinations Belize or Splash Dive Center. 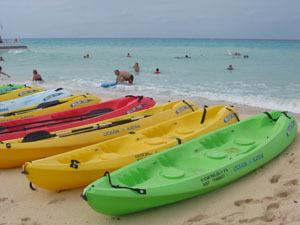 Put a twist on your romantic escape with a relaxing kayak trip between Belize’s picturesque cayes. With more than 200 cayes dotting the turquoise waters of the Caribbean Sea, this island hopping tour allows couples to pass through some of Belize’s most notable and alluring destinations on a peaceful path adorned with sweet tunes of whistling breezes and light waves. While paddling in tandem alongside schools of fish in Belize’s clear and warm waters, discover rare, scenic views of Belize’s most popular cayes including Ambergris Caye (known to be “the place to getaway”) and Caye Caulker (where islanders live by the motto, “go slow”). Plan your trip with Island Expeditions, Slickrock Adventures or Saddle Caye South. For adrenaline junkies, there’s no better way to stir up romance than with a heart-pumping adventure. Boasting Central America’s largest cave system, couples can experience an exhilarating exploration of Belize’s eco-playground when venturing to the untouched lands of Toledo District. For example, a tour of Tiger Cave begins at a massive, vaulted entrance that leads to an equally dramatic conclusion. Sunlight streaming through gaping holes in the cave’s ceiling eventually reveals an amazing overhead sight - 500-foot vaulted ceilings, interior chambers with dripping stalactites; and pure mineral deposits that look like pots of white gold. Sign-up for private tours through Ian Anderson’s Caves Branch, Cotton Tree Lodge or Monkey Bay Wildlife Sanctuary. As one of the last unspoiled places on Earth, Belize offers spectacular sights that simply can’t be reached by car. Uncover secrets of the jungle while exploring Belize’s pristine lands on horseback. Gallop across San Ignacio’s untouched lands, stumble upon a hidden waterfall, or spot one of more than 600 rare exotic birds in Belize. Horseback riding adventures are available through Green Dragon Adventure Travel, Banana Bank Lodge or duPlooy Travel. With direct flights from the U.S. and Canada, this tropical paradise is nestled between Mexico to the north and Guatemala to the west and south. It’s a wonderful place to rekindle romance any time of year. Visit www.travelbelize.org or Belize’s official online romance website, Belize in Love.